8oz. (240ml.) 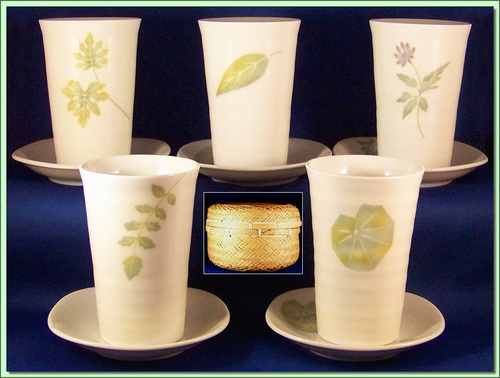 An absolutely beautiful gift set of five generous portion cups (for tea and other drinks) on coasters, each bearing a different delicate leaf on a glazed white background. The coasters ecah carry the matching cups pattern. And the whole set comes in a handwoven basket (see image in center inset) making it a really great and unique gift!